Celebrating our 95th year in Business in 2013! Welcome to Hanzel Auto Body Works. 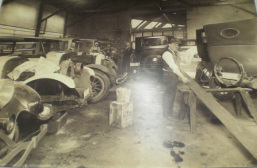 For the past 95 years our third generation, family run shop has consistently delivered quality repairs and honest service no matter how big or small the job. We are conveniently located off of the Broadway Auto Row between Broadway and Telegraph on 23rd Street and a short 3 block walk to the 19th Street BART station. New or old, foreign and domestic, we will get your vehicle back on the road looking like new. We work with your insurance company so you have one less thing to worry about. Come in today to see Henry Hanzel for a free estimate. Check out the page above for "Seconds Saturdays", our informal get together on the second Saturday of the month at the shop to celebrate all things car related. All cars are our specialty, from from old Citroens and Porsches to modern MINI Coopers.